As the train screeches to a halt, the young man, in his slim-fit Tom Ford suit, alights energetically. This is Revolution Square station, deep beneath Moscow’s congested boulevards. Built in 1938, the station is one of the gems of the Moscow metro system, itself one of the finest pieces of public transport infrastructure in the world. Stalin understood symbols. The metro system served as a reminder of the splendour of the Soviet Union. In the war, these places were air-raid shelters. In 1941 and 1942, a hundred war babies a month were being delivered down here as war raged overhead. What else are you going to do? Today, the metro carries seven million passengers a day, close to half the population of this enormous city of 15 million citizens. Trains arrive off-peak every two minutes and at rush hour every 30 seconds. There is still no advertising which, together with the Metro’s preference for a slightly dull, yellowish lighting system, means the underground retains a Cold War feel. Revolution Square is famous for its socialist realism statues depicting the mythical heroes of the revolution: sculpted soldiers, full-featured nurses and happy, smiling pioneer children, all gazing expectantly towards the bright communist uplands. The statutes are hewn from dark Armenian bronze. It seems to have achieved ideological perfection until you notice that at certain places the bronze on many of the statues is completely discoloured. The man in the Tom Ford suit, whose chiselled features wouldn’t have been out of place adorning one of these heroic monuments, interrupts his commuter run to pause at the statue of a heroic border guard and his dog. He bends down to rub the snout of the hound, whispers something and moves on. Within seconds, dozens of other commuters have repeated his ritual. All the rubbing has polished away the bronze, causing the statues to change colour. Such devotion has been going on for generations. The snout of the dog apparently brings luck. Other statues bring money, yet more bring good exam technique to students, others are rubbed for fertility and yet more for love. Superstition is alive and well in Russia. Here in Revolution Square, a monument to the secular, humanist ideology of communism, superstition and mystical devotion reign. These displays of superstition went on during the height of Stalinism and continued right up until Gorbachev, despite the best efforts of the party to replace faith and hocus-pocus with science and political ideology. The persistence of Russian superstition during totalitarianism, under the very nose of the Kremlin, is one of the many contradictions in this bizarrely contradictory country. For me, who visited first in the late 1980s, trying to understand Russia has been a long and fruitless matriculation. Taking in the view from Moscow is always an eye-opening experience. At the Russian stock exchange last Friday night, where I was giving a talk, discussion of Brexit was mercifully brief, and the conversation on Russian relations with China, Germany and the world was fascinating. This year marks the 20th anniversary of Putin in power – a leader often scorned in the West, but supported by the vast majority of Russians. I was in Kiev when Putin came to power in late 1999 and Russia was a broken, emasculated and impoverished country. It had just defaulted, and the currency had collapsed. Banks failed and deposits disappeared. Nato was circling it and its enemy, the United States, was the world’s pre-eminent superpower. Deep down I suspect most Russians would like the West to respect them. This is one of the contradictions masked by the nationalist pomp. But if they can’t get respect, fear and dependence will do. There is an understanding here that, while the world might never love Russia, it needs Russia. It is the world’s largest producer of crude oil and the second-largest producer of dry natural gas. It sits upon the largest natural gas reserves in the world, with the industry dominated by Gazprom, a state-run agency. Russia currently controls 23.7 per cent of the world’s proven natural gas reserves, 14.8 per cent of recoverable coal reserves and a further 4.8 per cent of the proven crude oil reserves. Russia ranks third globally in primary energy production and consumption, and was the fourth-largest generator of nuclear power in the world in 2016. What’s more, in terms of building nuclear capacity, they rank second globally, just behind the Chinese. Russia’s relationship with China is critical because Chinese demand puts a floor on commodity prices, thus ensuring Russian national wealth. China and Russia are close. Remember, China is energy-poor. The China National Petroleum Corporation (CNPC) and Russia’s Rosneft are engaged in a joint venture, where CNPC holds a 49 per cent stake, to develop Russia’s East Siberian oil fields. 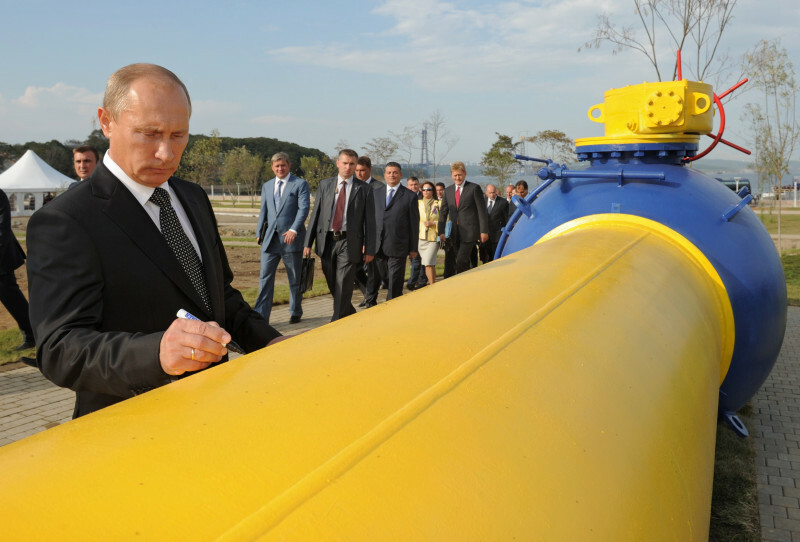 They have signed deals for Russia to send China up to 800,000 barrels per day of crude oil by 2018, mostly by pipeline. In 2014, Russia and China signed a major gas deal, following many years of negotiations over the import price and the supply route. China now buys an annual 1.3 trillion cubic feet of gas from Gazprom’s East Siberian fields for $400 billion over a 30-year period. In Europe, around 40 per cent of EU member states’ natural gas imports flow through Nord Stream pipelines in the Baltic, connecting the continent to resource-rich Russia. Demand in Germany alone jumped 22 per cent between 2014 and 2017. Russia accounts for roughly half of Germany’s natural gas imports, while in other EU countries this figure is close to 100 per cent. More than one-third of crude oil imports to European countries in the OECD in 2016 came from Russia. Whether we like it or not, Russia and Europe are glued together in a brace of dependency. The two “great” Romanov political geniuses – Peter and Catherine – understood this; the present tsar Vladimir Putin knows it too. The man in his Tom Ford suit, all Western on the outside, all Russian on the inside, embodies it. The question is: do we get it? © 2018 David McWilliams. All Rights Reserved.